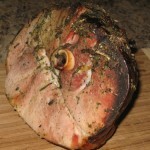 Another ham recipe in my repertoire that you must try. Preheat your oven to 350, rinse and pat dry ham then place in roaster in pan onto counter at least 30 minutes while your oven preheats. Make 2-inch deep slits all over ham. Place all ingredients up to the broth in a food processor or blender and whirl to a paste. Stuff 1/2 of this mixture into the slits as best you can and then pat it lightly over the ham, set the other half aside for now. Bake, uncovered, for about 90 minutes. Reduce oven temp to 325 degrees, add the broth to the pan and bake uncovered for another hour. 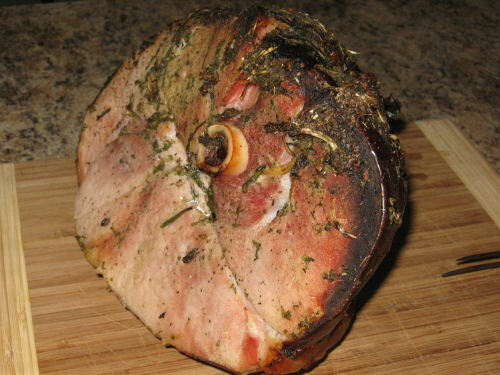 Pat the remaining paste over the ham, cover the pan tightly with foil and continue to roast it for another 2 hours or until done, checking, adding a cup or two of water as necessary, and basting only occasionally. Remove from oven and let rest about 10 minutes before serving.